"Dynamite... the characters, the situations, the pacing, the structure, and the writing are so good." After a devastating event shattered his life, Jackson Donne has gone into hiding in the forest of Vermont. Under the guise of Joe Tennant, Donne has been recovering -- and even enjoying his life up north. Until one of the few friends he's made goes missing. Meanwhile, back in New Jersey, someone is killing ex-cops -- the ones who Donne used to work with. Terrified Donne is committing the murders, a former colleague hires private investigator Matt Herrick to track down New Jersey's most famous fugitive. Herrick agrees and almost immediately, there's a bounty on his head. The closer Herrick gets to tracking Donne down, the more dangerous the case becomes. And once Donne and Herrick cross paths, the two cases tie together, and Donne realizes he must go back to the life he left behind. Because the past has come calling, and if Donne does face up to it, he and Herrick could lose everything, including their lives. 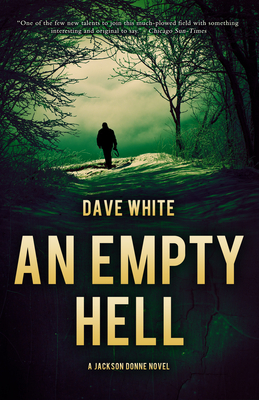 Dave White is the Derringer Award-winning author of four novels: When One Man Dies, The Evil That Men Do, and Not Even Past in his Jackson Donne series, and the acclaimed thriller Witness to Death. His short story "Closure," won the Derringer Award for Best Short Mystery Story. Publishers Weekly gave the first two novels in his Jackson Donne series starred reviews, calling When One Man Dies an "engrossing, evocative debut novel" and writing that The Evil That Men Do "fulfills the promise of his debut." He received praise from crime fiction luminaries such as bestselling, Edgar Award-winning Laura Lippman and the legendary James Crumley. His standalone thriller, Witness to Death, was an ebook bestseller upon release and named one of the Best Books of the Year by the Milwaukee Journal-Sentinel. He lives in Nutley, NJ.